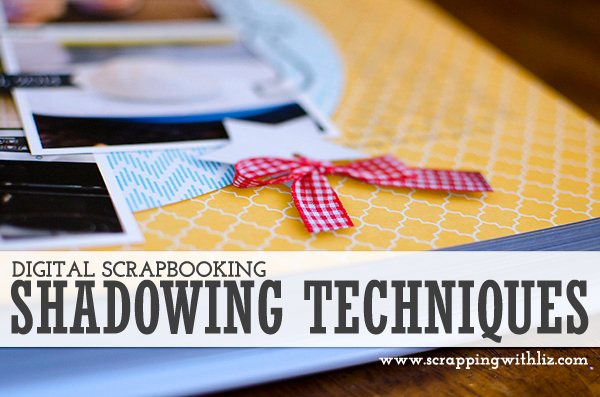 I've had a few people ask me how I get realistic shadows on my digital scrapbook pages. I'm always surprised by this since I feel like my shadowing can always use more work. I'm constantly trying new things and adjusting what I do, never feeling that I'm quite there. But since you guys asked I'm answering. Since there are so many great shadow tutorials out there I thought, instead of writing my own tutorial, I would just share the different tutorials I've read that have helped me and share with you some of the shadow styles I use, and I even made my own little set of FREEBIE shadow styles. 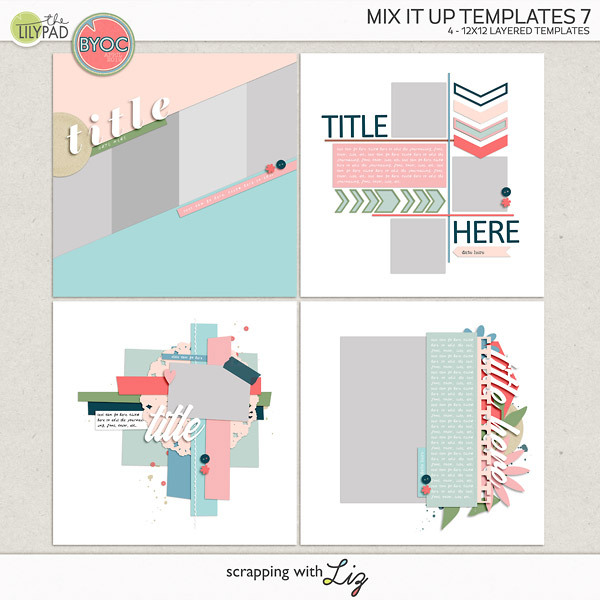 They are the same styles I use on my templates. Let's begin. The very first tutorial I ever read on shadowing was over at One Little Bird. She has a great tutorial (Shadowing - The Basics,) showing you the basic settings you should use for your shadows and then she goes into more details on how to customize the shadows by putting the shadow on a different layer. The very first set of shadow styles I ever downloaded were from Megan Turnidge. She has a free set (still available) on her blog along with a little tutorial. That's where I learned to warp those shadows, probably one of the quickest, easiest ways to customize your shadows. Chelle's creations also has some great tutorials that I've read. Here's a great summary on some different shadowing techniques. You can also purchase Chelle's shadow styles here. I just read this tutorial about using the wave filter on paper layers and I'm definitely going to be trying it soon. It looks like such a simple way to get a realistic shadow on paper layers and even some elements. For those of you who use Photoshop Elements and can't put your shadow on it's own layer (which most these tutorials require) make sure you check out this video tutorial from Fiddle-Dee-Dee Designs. And here are some free shadow tutorials. These are what I usually use on my templates. They are just a start though, try some of the techniques above. If you have any favorite shadowing techniques please share them in the comments. I'm always looking for ways to better my shadowing. I desperately need help with shadowing. I have PSE9. Can I use these shadows with that? Great roundup, Liz! I also started with Megan's shadow styles. :) Now I use mostly One Little Bird's Shadow Like Me set and sometimes the set from Chelle's Creations. I have a set from Krista Sahlin also. I love that I can just apply one and be done, but that I can take my time and mess around with them if I feel like it. :) One Little Bird's washi tape shadowing tutorial was really helpful also. 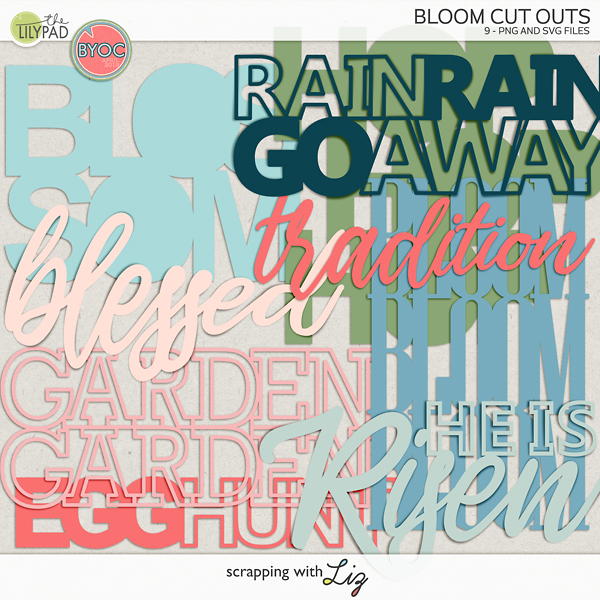 Here's that one: Digital Washi Tape Tutorial. When I was typing up that comment, I completely forgot that Liz had included a free set of shadow layer styles in the post! Ha! :) So, April, I'm sure you could ask Liz if you have any trouble installing them. I'm not sure if she included the metadata files or not, but it's a simple process either way. :) I'm going to go try them out now! Thanks so much for this! Now I need to sit down, read, and give it a try. I'm back! :) Liz, I love the shadow styles! Thank you so much! I just finished a page using them and posted it to my blog: My Birthday: 30 + 9. Oh my goodness, awesome Jenny! And thanks for answering the questions. April - they should work in PSE9. April, you can separate a shadow layer style from an element in PSE. Liz linked to my video tutorial about how to do that, so you will have the ability to do lots of customization of your shadows. 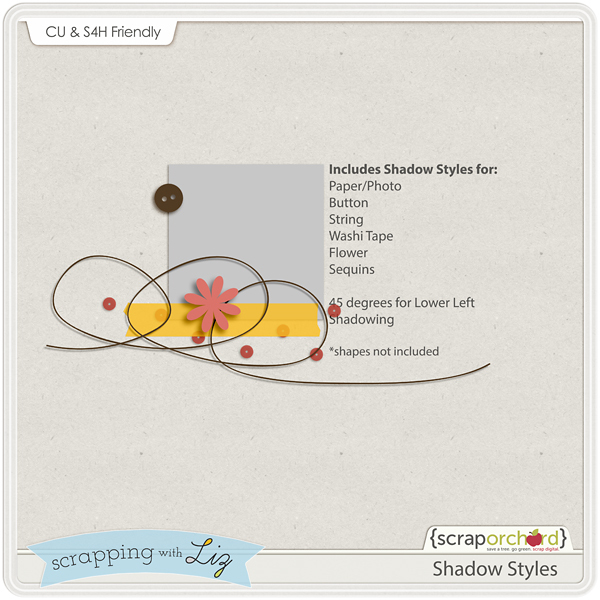 The method I use works for any shadow style set, including Liz's, or the set that is included with your program. Awesome write-up, Liz, and thanks for the shout out! Somehow has even created a small action for the wave filter somewhere. I use it all the time, it IS great for paper. I took a class about custom shadow mastery at Digital Scrapper some time ago and that class teaches the most intricate shadows (various combinations of shadows on one item etc. ), but usually I don't go to such great lengths. But putting the shadow on its own layer and tweaking it definitely hleps a lot. I have PSE12 & I'm still learning how to make my shadows more realistic ... which is what drew me to start digi-scrapping. Thank you for sharing the shadow styles & for all the information that is around the web; especially Cheryl's tutorial! oh my goodness! This is so what I needed. Thank you, Liz!! Ty Liz! I love styles & shadow ones are always usefull.